The Highland Park Fish camp is located on a beautiful portion of the St. Johns river called the Dead River and is adjacent to the Lake Woodruff National Wild Refuge. The Fish Camp rents out a variety of boats, including bass boats with trolling motors and pontoon boats with porta-potties as well as all the equipment you would need for a day of fishing. You can either explore the stunning Florida ecosystem on your own or hire a professional guide who knows all the best spots for a successful fishing trip. After your fishing trip, the staff will clean the fish you caught and even teach you how to do it yourself if you are interested in learning. If you don’t want to fish, you can rent a boat to explore the waterways to spot wildlife, particularly an astonishing variety birds. Over 215 species of wading birds, shorebirds, raptors, migratory waterfowl, and songbirds have been counted. 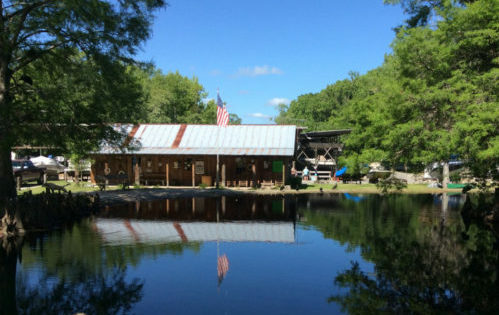 At the Fish Camp, kids have fun catching and releasing bass out of the stocked pond—it’s free as long as you purchase live bait from the Fish Camp. Highland Park Fish Camp also rents fully furnished, air conditioned rustic cedar cabins. They also have sites for tent and RV camping. The pontoon boats are popular to rent so make your reservation at least a week in advance. Boats without a motor $20.00 per day. 15 HP, 15′ boat $79.00 per day, bassboat $159.00 per day, 23′ pontoon boat $189.00 per day. Half day rates available.